Always hackers will be doing something different and trying something different.This time they are into messaging app why because it has huge popularity. 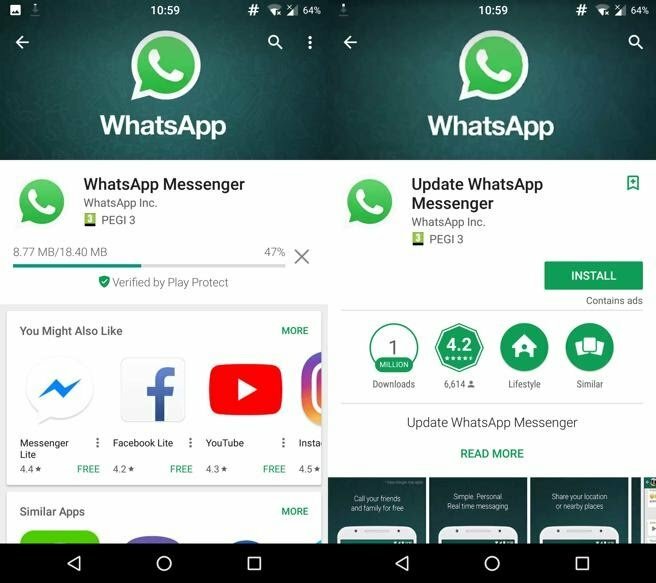 Generally, these things will be sorted out very quickly by Google play store but this time they didn't and fake WhatsApp has been downloaded by more than one million people. If you observe the screenshot the logo is similar but the only difference is the name the fake WhatsApp is called "Update Whatsapp Messenger". So be aware and don't download the fake one. See if you want to know wheater you have downloaded the fake WhatsApp by mistake. Goto Settings -> Installed apps. Here if you find any to WhatsApp icons delete it and download the proper one.